The famous and rare 1795 Nine Leaves variety has been known since the 1930s or perhaps earlier, the discovery coin being in the collections of H.O. Granberg, William H. Woodin, and Waldo C. Newcomer. 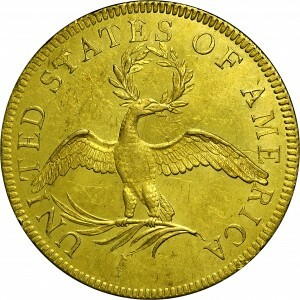 Approximately 18 examples are currently known, making this the rarest 1795 eagle variety. This example is one of the finest known and was acquired by Harry Bass in 1971. Its prior pedigree is not specifically known. However, this may be the example that was offered by Superior as part of the Pradeau Collection in 1970. Every known example has heavy reverse die defects below the branch. Purchased from Goliad Corporation, December 16, 1971. 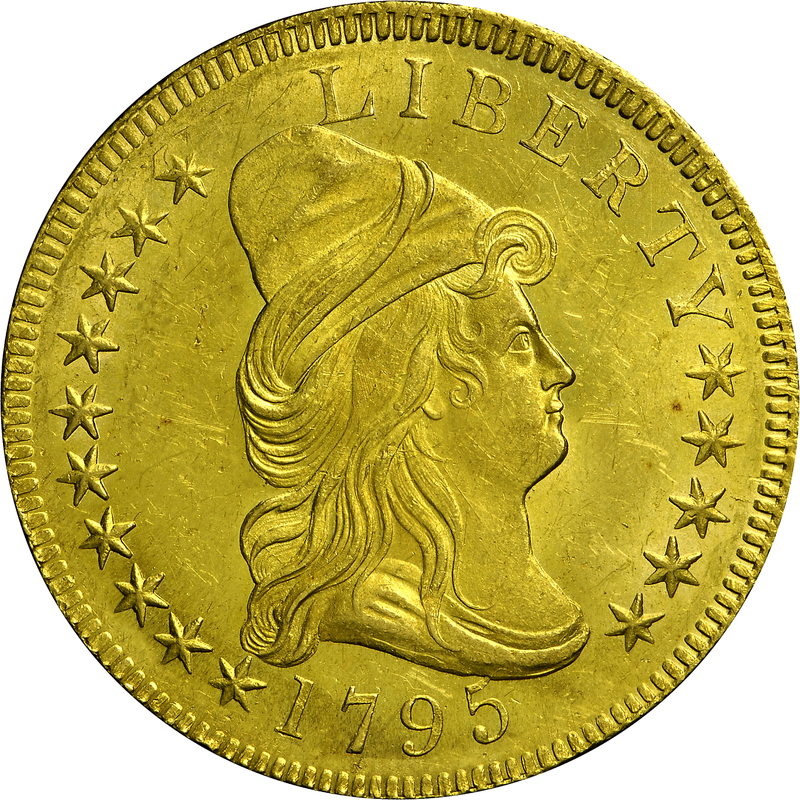 "Obverse: Tip of 5 overlain by bust base (distinctive). L touches cap. No stars touch, although many quite close. All stars perfect, having points of uniform length. Point of star 11 not close to Y. Now lapped, exterior points of stars 1, 10, 11, 15 noticeably shortened. Reverse: Nine fronds on palm branch (distinctive). Branch tip points to left serif of right stand of A, not touching. Serif of R very close to left wing. One frond end beneath center of base of U, not touching. End of wreath's top right leaf overlain by S, an edge barely visible within lower opening of S. One right outside leaf has hollow interior. Lapped, eagles tail incomplete at its junction with leg. Large die imperfection in field below palm branch, touching second frond from the right. Another die imperfection embraces top half of first T in STATES. Beginning stages of another at first A of AMERICA."